Hippocrates gave good advice when he said “Let food be your medicine and medicine be your food.” What we eat has a major effect on our health and well-being. One of the healthiest foods you can eat is ginger. Widely used in traditional Chinese medicine, ginger has been recognized for certain healing properties for well over 2000 years. The Romans discovered ginger in India and imported it to Europe, where it was used not only as medicine, but in cooking as well. Candied ginger was particularly popular (and remains so today). Ginger was so valuable during the Middle Ages that a pound of it would cost the equivalent of one sheep. Colon and ovarian cancer – As a powerful anti-inflammatory, a study performed by researchers at the University of Michigan medical school found that ginger reduced inflammatory markers in the colon, which are a precursor to colon cancer. In addition, when ovarian cancer cells were exposed to ginger they either committed suicide or devoured themselves. Ginger also helps keep cancer cells from becoming resistant to cancer treatment and reduces chemotherapy associated nausea by up to 40% when taken with anti-vomiting medication. High blood pressure – Thai researchers from Chiang Mai University found ginger extract to be more effective than medication in reducing hypertension in laboratory rats. 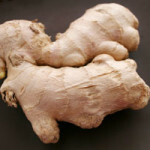 Asthma – When purified elements of ginger were used in conjunction with the asthma medication isoproterenol, the airway smooth muscle that contracts during an asthma attack relaxed far more than when the isoproterenol alone was used. Ginger seems to have a synergistic effect on this anti-asthma medication. Muscle pain – Taking a daily ginger supplement can reduce muscle pain caused by exercise by up to 25%, according to researchers at the University of Georgia. And over 80% of women who have painful menstrual periods can benefit from ginger supplements, if taken during the first three days of their period. 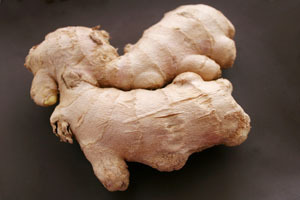 Migraine headache – The results of an Iranian study published in the journal Phytotherapy Research found that ginger powder is as effective as the medication sumatriptan, which is commonly used to treat migraine pain. Liver damage caused by acetaminophen – It is commonly known that taking large amounts of Tylenol (acetaminophen) or taking it for an extended period can cause liver damage. But researchers have found that pre-treatments with ginger or taking ginger along with acetaminophen can reduce the incidence of liver damage. Always speak with your doctor before taking ginger, since it can interact with other medications (particularly blood thinners). Including more ginger in your diet can be a great natural way of keeping healthy while adding flavor to your meals.